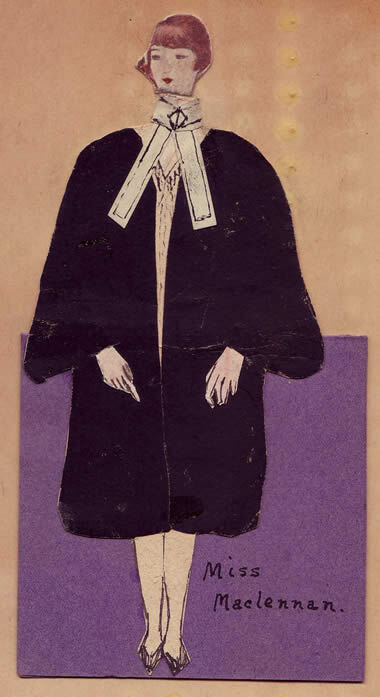 This handmade card, in the shape of a female lawyer in robes, contains a toast list for a Women’s Law Association of Ontario dinner. Toasts were made to the King, Canada (1867-1927), the profession, the women graduates of 1927, and the women graduates of 1987. A newspaper of the time reported, "The concludingtoast was most amusingly given and responded to by Mrs. James Bicknell and Mrs. J. Harkins – to the graduates of 1987 – whenonly a few stray men would be called to the Bar and when all the judges would be women".